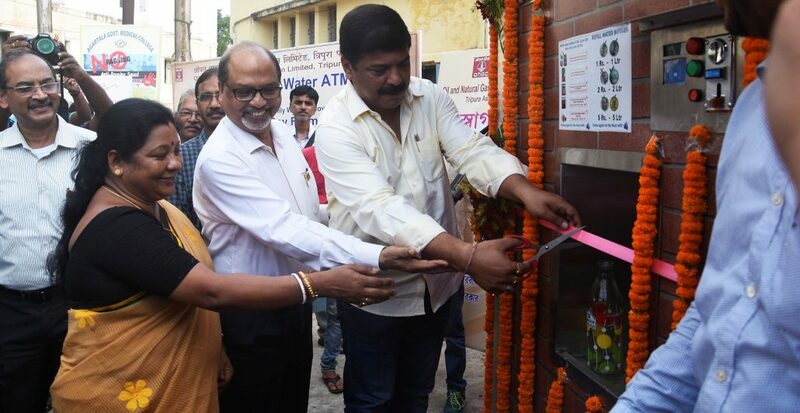 Tripura Health and Family Welfare Minister Sudip Roy Burman along with ED- Asset Manager of ONGC Tripura Asset, G K Singha Roy inaugurated a Water ATM at the GB Pant hospital in Agartala. With it, the capital of Tripura received its fourth drinking water vending machines or water ATMs, as they called in common parlance, courtesy the ace Maharatna company of India. The installation of the water kiosk on the very culminating day of on-going Swachhata Pakwada -2018 under Corporate Social Responsibility (CSR) programme of ONGC attracted a lot of visitors in GB hospital campus. The first three water kiosks were installed by ONGC at Tripura Medical College, Cancer hospital and the third one at IGM hospital at Agartala received lots of kudos from citizens. Health Minister appreciated the efforts of ONGC and its Asset Manager G K Singha Roy, for installing the Water ATMs at the most important hospitals of Agartala and which would largely benefit the patients and patient party. He further added that the state government is making all-out efforts to realize the dreams of Swaachata of Prime Minister Narendra Modi and such initiatives are adding to that. Each of the water ATM, costing around Rs 10 lakhs, has been donated to the hospital under CSR scheme of ONGC. The maintenance of the water kiosks would be taken care by respective hospital authority. The water ATMs made by a TATA group company has an inbuilt storage capacity of 1300 litters with a provision of a storage capacity of 300 liters of chilled water. The unit is fully automatic with a provision of operations through card as well as currency coins for controlled dispensing.